Or, get it for 65200 Kobo Super Points! 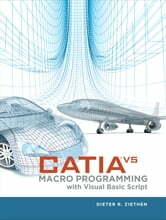 CATIA V5 Macro Programming with Visual Basic Script shows you, step by step, how to create your own macros that automate repetitive tasks, accelerate design procedures, and automatically generate complex geometries. Filled with full-color screenshots and illustrations, this practical guide walks you through the entire process of writing, storing, and executing reusable macros for CATIA® V5. Sample Visual Basic Script code accompanies the book’s hands-on exercises and real-world case studies demonstrate key concepts and best practices.